Download (this erroneously says it is version 1.2.3) version 1.2.3.1 released on 19.02.2009. This requires at least Windows XP. "-minimized" = Start the program in minimized mode. If there is one parameter left unprocessed, it is considered to be an image file name and the wallpaper is set with that image. Note that if the file name contains spaces, it must be surrounded with quotes. 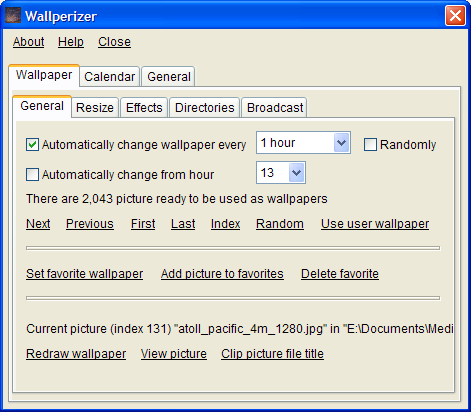 Wallperizer is a desktop wallpaper changer. Once you install it, the program only asks you one directory from where to use pictures as desktop wallpaper. After this, the program will be accessible from the system tray menu. You can add up to 100 directories where the program would look for pictures which would be used as wallpapers. The wallpaper can be changed automatically, either in order or randomly. Brightness normalization is an automatic process where bright pictures are made darker and dark pictures are made brighter, which can be used to bring the brightness of wallpapers close the to environmental light. A calendar can be displayed on the wallpaper. Calendars have skins. You can edit, load and save calendar skins. See this example. If you have the option "Show Desktop icons" unchecked, the wallpaper picture may remain unchanged (even though Wallperizer shows that it has changed the current picture). There is a small bug (in the operating system) with the outlined text, particularly the letters "M" and "W". When the thickness of the outline is increased, some lines become visible, though they should not be there. These artifacts get smaller when the size of the font is increased. The artifacts appear only for some fonts (like Verdana), but not for others (like Candara, Georgia and Trebuchet MS). When I press Win + L, the font from Wallperizer's calendar changes. If you have a shortcut manager installed on your system, try to close it and see if the problem persists. A report has been made that "TaskSwitchXP" does just that. The wallpaper is automatically changed on Windows 7. The program's tray icon displays the file name of the current wallpaper, when the mouse hovers over it. Changed the directory where the wallpaper is stored (to the system's temporary directory) in order to avoid certain problems. Added a label below the list of directories from which the wallpaper pictures are loaded, which shows the entire name of the focused directory. This is useful when a directory name is very long. Added a one minute wallpaper change interval. Added a system hotkey to display a random picture as wallpaper. Added an option to display wallpapers starting from a sharp hour, like 08:00 or 15:00. Added option to center pictures. Fixed bug with the color of the week header when Sunday was the first displayed day. Added an option to resize pictures so that the smaller axis fits the screen, while the other resized axis is cropped. This option brings out the central part of pictures. Added an option to display the first calendar day either Monday or Sunday. Added a new brightness normalization method. You may distribute Wallperizer for commercial purposes. Bug fix: There were some pictures (non JPEG) that were causing the program to close / crash. 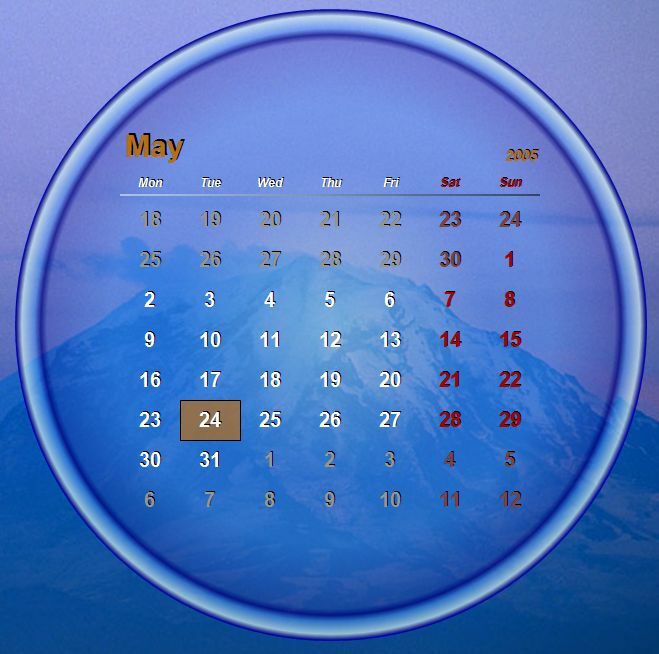 In the dialog where the position of the calendar is modified, the oval shape of the calendar is displayed. Added two skins (actually, just the colors are different). Added a horizontal line which separates the calendar header from the calendar body; it is right below the days of week. The method used to normalize the brightness can be: direct scaling (which preserves better the vibrancy of the colors of the picture), mirrored scaling (which preserves better the details of the picture), balanced scaling (which preserves best both the vibrancy of the colors and the details of the picture). It is recommended to use balanced scaling. Added the "Visible background" system tray menu to show or hide the background of the calendar. Bug fixed: there was a bug in the positioning of the calendar, when its bounds were outside the desktop. First public release of Wallperizer: version 1 on 8 May 2005.